Foot patrol or "beat officers" have been around as long as modern day policing itself. Although many police forces discontinued walking beats between the 1920s and 1950s in favour of motorized patrols which were deemed to be more "efficient", the last few decades have seen a resurgence in foot patrols. Foot patrols increase police visibility in busy areas, enhance our citizens' feeling of safety, and build bridges between citizens and police. Beat officers have an intimate knowledge of their area, often knowing shopkeepers and regulars by name. 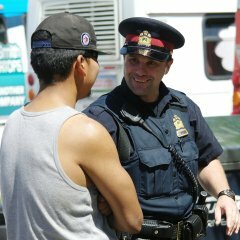 The Saskatoon Police Service deploys beat officers 365 days a year, primarily in the downtown, Riversdale and Broadway districts. Additionally, beat officers are used in other areas of the city on designated days. 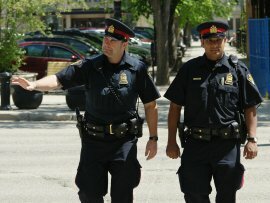 Foot patrol officers are expected to visit businesses along their beat and to interact with citizens. They also respond to calls for service within their area. Beat officers are often able to assist other police officers in identifying suspects due to the extensive knowledge base they develop while on patrol. Officers walking the beat have volunteered to do so and consider it to be a very rewarding task.